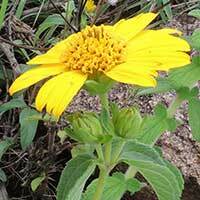 Large yellow-orange composite, but smaller than cultivated sunflower. Leaves variously three-lobed. 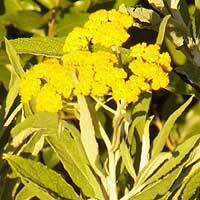 Mostly herbaceous up to two meters tall. Garden favorite. Composite with bright yellow notched rays, darker disc florets and few broad phyllaries. Common in crop fields after harvest. Lower growing than previous, 3-5 dm. Leaves shorter, elliptic to triangular. 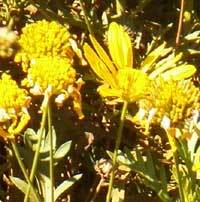 Bright yellow rays are toothed at the tip. Plant growing prostrate thus avoiding grazing animals. Bright yellow rays and bright yellow disc florets. 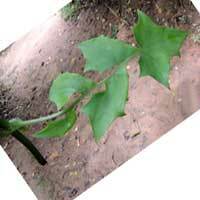 Leaves are deeply, pinnately cleft into lance-shaped segments. 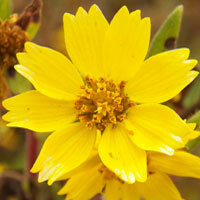 Grows as an evergreen suffrutescent shrub. Under grazing pressure this one grows very close to ground. 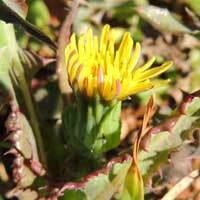 Two + series of phyllaries with very long, slender, reddish tips. Seeds with many white awns. 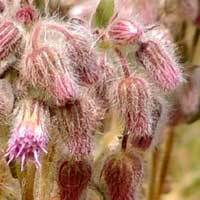 Heads become pendulous as ray flower seeds enlarge and broad wings develops on the achenes. Small yellow composite from wooded area understory. Phyllaries smooth and nearly fused. Very similar to #1 but leaves and stems with fine hairs and the head is shaped differently. Taita Hills. Leaves and involucre with sharp prickles. 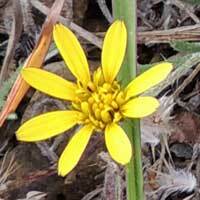 Many, long, narrow, yellow ray flowers. 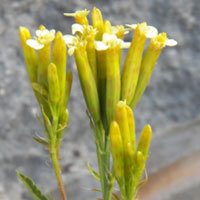 Yellow heads of entirely strap-shaped florets. Heads closed up in this view. Leaves prickly and white sap from breaks. 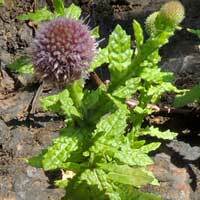 Plants about 30cm tall and entirely herbaceous. The slender heads appear to open only part way at the tip. The base of the leaves clasp the stem. 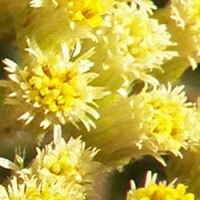 Heads are composed entirely of yellow, strap-shaped floret. Leaves all basal. Seeds with plumose bristles. 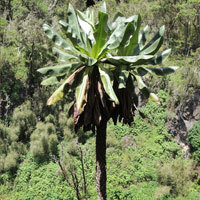 Tree-size plants with large leaves found at higher elevation. Most conspicuous in high alpine areas. 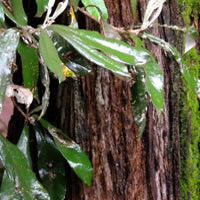 Old leaves and leaf-bases cloak the trunks. 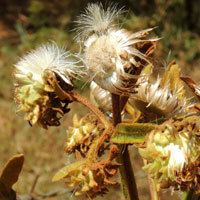 The leaves and stems covered with cottony hairs. Heads yellow, rayless. 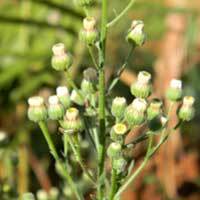 Low herbaceous stems in cluster. 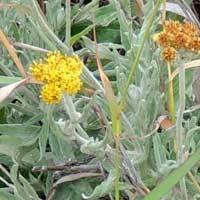 This Helichrysum (?) 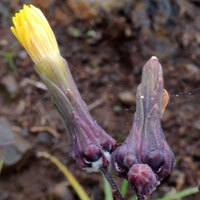 composite was found growing on the Elgeyo Escarpment near Iten, Kenya. The leaves and stems appear silvery white due to a cover of short pubescence. About 1½ m tall. 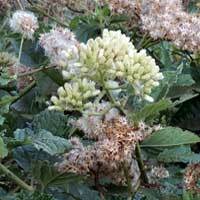 Numerous small, cream/yellow heads clustered at top of mostly herbaceous plant. 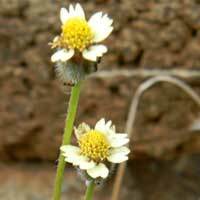 Disc flowers yellowish and short papery white ray flowers. 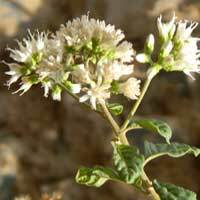 Involucre pubescent. The gray-green leaves are dissected into nearly linear segments. 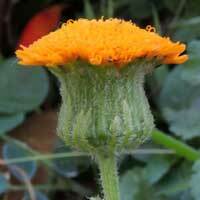 The heads are small, densely clustered at top and have only discs florets. Numerous bright yellow ray-less heads. Lance shaped leaves are irregularly toothed. Suffrutescent. Composite with yellow disc florets and no rays on many small heads. Smooth, elliptic leaves with distinct serrations. 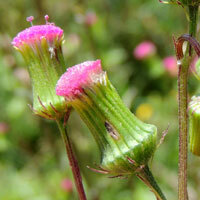 Slender flower heads with one series of phyllaries. 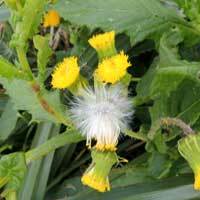 Bright yellow florets followed by seeds with white fluff tops. 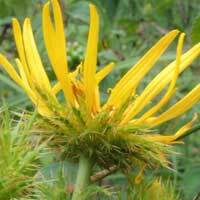 Mostly herbaceous, 1m tall. 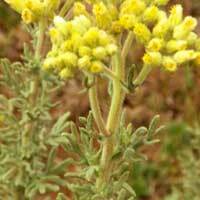 Herbaceous, weedy ragwort of moist soil. Rayless heads are enlarged below. Seeds with long, silky pappus. 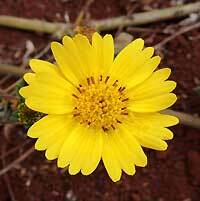 Yellow florets emerge from the top of the spherical head which is well-armed. 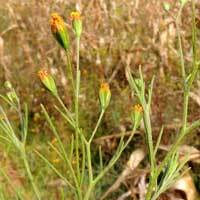 Weed in grazing areas and farms. Another import from the New World. 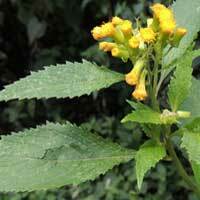 Small yellow-orange heads on herbaceous weed with finely dissected leaves. Milky juice emerges from broken stems like farm lettuce. 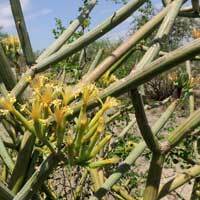 Pale yellow florets on tall wiry stems. Composite with white rays and yellow disc florets. 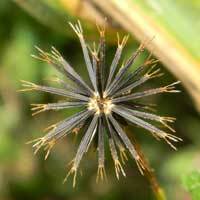 Seeds with two barbed spurs. 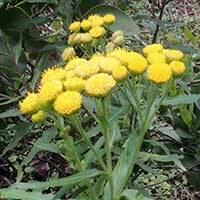 Common non-native weed in gardens. 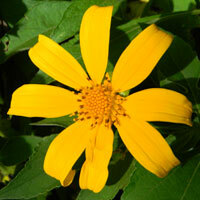 Tree-sized member of sunflower family. Flowers white, in ray-less heads. Leaves elliptic and leathery. 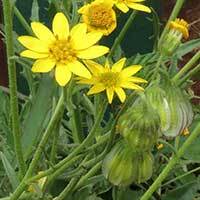 This herbaceous plant in the Asteraceae was found growing in Nairobi. Short white rays, yellow disc and plumose hairs atop seeds. Tall slender heads with a few white rays and yellow discs. Leaves compound and with resin glands. Composite with non-showy flowers in many small heads. Seeds soon shed with fuzzy top for wind dispersal. 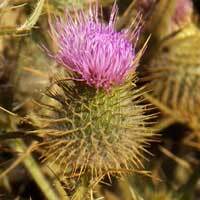 Soft hairs cover the leaves. 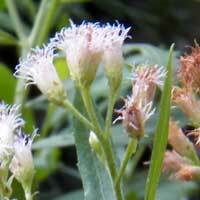 Numerous small convex heads of white florets set atop an herbaceous weed about 1 m tall. Numerous small heads in pendulous spikes. 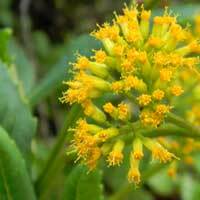 Leaves pinnately lobed. Tall shrub. Flower infrequently, perhaps once per year. Clusters of small pale lavender heads. Leaf blades continue down sides of stems making them look winged. Blue-violet heads of disc flowers. Leaves are deltoid with toothed margins. Common in gardens and hedgerows. 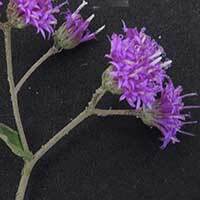 This Vernonia-like composite was found in a fresh water marshy area near Mombasa. The flowers are pale lavender. 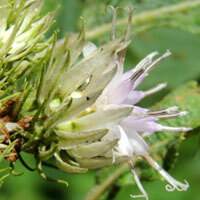 All tubular flowers in heads are mostly white, tinged with purple. 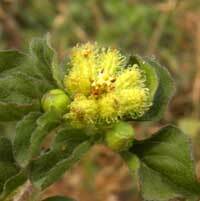 Broadly lanceolate to elliptic, serrated leaves. Mostly herbaceous. Numerous, small heads of bright lavender-purple flowers are displayed in flat-topped panicles. Large dia. heads with fine, white, bristle-topped seeds. Ridged stems. Rust-colored pubescence. Lance-shaped, serrated leaves. Shrubby, leafy plant about 1.5 meters tall. 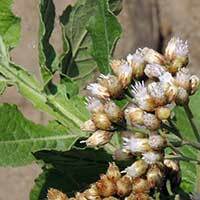 Numerous small white flower heads followed by abundance of comose seeds. 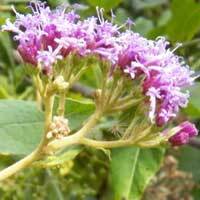 Many branching shrub or perennial with purple, pubescent phyllaries. Tubular disc flowers are lavender. Leaves alternate, serrate. 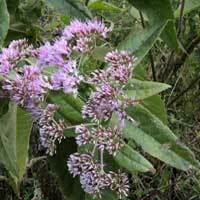 Large shrub, occasionally tree-form with large clusters of purple/lavender flower heads. Leaf bases lobed. partly around the stem. Nearly linear leaves are dark green and have a wrinkled texture. Seeds topped with light brown awns. 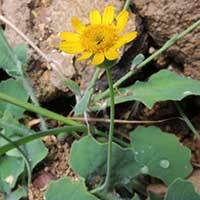 In an area of heavy grazing pressure this plant grows vine-like close to the ground. 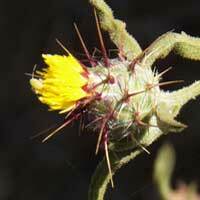 Sharp spines guard the leaves and flower heads. 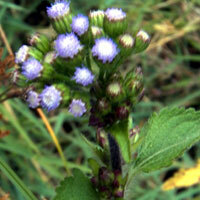 Flowers are showy lavender-purple. 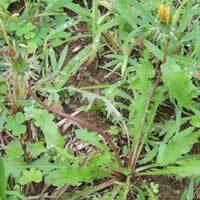 Weed in grazing areas and farms. 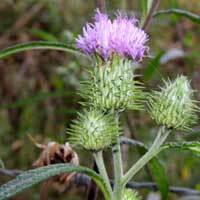 All leaves and even the large spiny flower heads grow close to the ground. The florets are pale lavender to purple. Seeds with long silky hairs. Nearly spherical clusters of very small flower heads. Stems leafy wings. Ill-scented. Forms thickets of green, succulent stems. 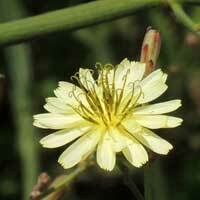 Flowers are cream-yellow and produce seeds with long awn-plumes. 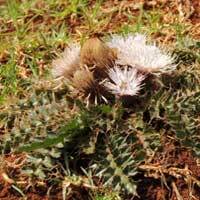 This weed with drooping flower heads is widespread in highland agricultural areas as near Kitale and Nandi. Seeds are topped with fine, capillary bristles. 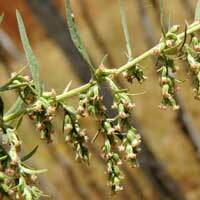 The leaves, stems and inflorescence are all fairly well clothed in soft hairs. 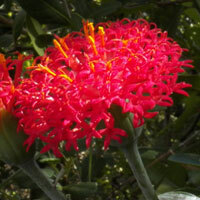 Herbaceous, about 1m tall, in moist, partial shade. 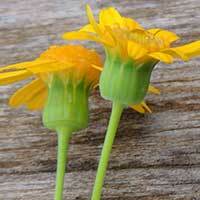 A single series of waxy-smooth phyllaries subtend the long, 5-lobed disc flowers. Partially succulent. 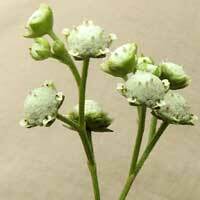 Obscure, green-white flower heads give rise to clusters of burrs with hooked spines. Tall forest tree with leaves silvery below and clusters of many small cream-colored flower heads. Disclaimer: By no means am I an expert on the Natural History of Kenya. I am new to exploring this wonderful part of the World. By creating a page for the species as I learn, or even while I'm still unsure, them I am teaching myself. If I make errors I hope that a kind person will let me know so that I can make corrections.